Finally It’s Here: The Ideal Oven Thermometer! This well-designed thermometer the BlueDot alarm thermometer and it’s produced by Thermoworks, the same wonderful company that makes, among other things, my favorite instant-read thermometer the Thermapen. 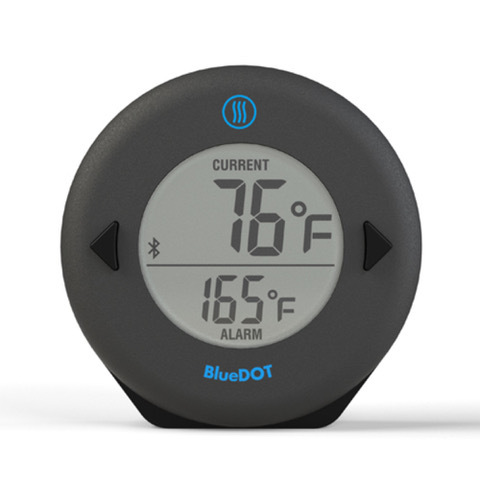 What makes the BlueDot so special and valuable is that it comes with a downloadable Ap which means that you can read the temperature on your IOS device (and soon Android as well) from up to 95 feet. But what is more important to me is that it graphs the range of temperatures as the oven fluctuates. The BlueDot is accurate +/- 3.6˚F/2.0˚C at a range of 248˚F/120˚C to 392˚F/200˚C which is the range of most baking. You can also purchase an inexpensive stainless steel grate clip that works perfectly to attach to an oven rack to hold the probe in place.